The Client provides corporate video production services to a wide range of businesses and organizations in New Zealand. The company specializes in video projects for advertising, corporate communications, event coverage, and motion graphics. The Client offers video production services to corporate and business customers all over New Zealand. The company maintains a portfolio of video projects used in internal and external communications, company profiles, corporate announcements, events coverage, customer testimonials, product guides, training resources, and promotional materials. The company recently ramped up its customer acquisition objectives, with particular focus given to mid-sized organizations located in the Auckland and Hamilton areas. The Client wanted to grow its market share in the “Golden Triangle” region, where the company expects demand for corporate video productions to outpace the rest of the country. In order to meet its new targets with the sales resources and manpower it currently has, the Client believes it’s going to need the help of a third-party agency doing much of the top-of-funnel prospecting legwork, so that its sales development team can exclusively focus on mid- to bottom-of-funnel stages. The Client partnered with Callbox after reviewing proposals from a number of marketing agencies. Callbox met all the Client’s requirements in terms of value and experience, with the Client saying that the extensive New Zealand records in Callbox’s proprietary database was a key determining factor. Callbox then closely collaborated with the Client to plan out a 3-month appointment setting campaign that integrated one-on-one calls with targeted email outreach. The campaign’s overall goal was to introduce the Client’s video production services to relevant decision makers from companies in its target industries and to book qualified prospects for a meeting with the Client’s reps.
1. Callbox compiled the target list which included various job titles relevant to the Client’s suite of video production services. 2. The Client reviewed and approved the call script which was prepared by the Callbox campaign team. Aside from probing questions, the script also included items designed to gather other pertinent information from the prospects. 3. Successful calls included contacts who expressed interest to know more or currently have a definite video production requirement. Prospects who agreed to meet with the Client’s reps over the phone or at their office were tagged as qualified appointments. 1. Callbox created the template for initial email outreach, while the Client provided the template used to send out additional materials. 2. The Callbox team continuously tracked and refined each component of the email marketing campaign in order to maximize response rates. 3. The Client received real-time campaign updates and helped plan email marketing cadence using Callbox Pipeline, the company’s proprietary CRM and marketing automation tool. The campaign began by initiating contact and nurturing warm leads through targeted email outreach. Accordingly, most of the results generated during the campaign’s first couple of weeks were almost exclusively related to email marketing initiatives, including average delivery rates of 98%, open rates of 33%, and CTRs of 7%. 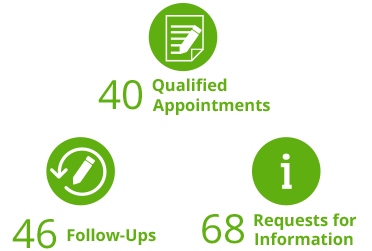 Out of the 40 total qualified appointments, the Client expects to turn 75% (or 30) into sales-qualified opportunities. With average close rates of 60%, the Client can potentially generate around 18 new customers from the campaign within the next sales cycle. The Client is the satellite communications unit of one of Asia’s largest telecom groups. The company specializes in both fixed and mobile satellite services, providing customized satellite solutions to corporate customers in industries such as oil and gas, shipping, transportation and logistics, banking, and broadcast. The Client currently has an ongoing appointment setting project with Callbox. As part of its 2018 marketing goals, the Client wants to double down on maritime satellite opportunities in Asia, as well as tap into additional EMEA markets. This leg of the campaign focuses on the Client’s two Inmarsat Fleet One offerings. Inmarsat Fleet One Coastal covers data and voice services for smaller recreational and fishing boats sailing closer to shore, while Inmarsat Fleet One Global gives access to bundled data and voice anywhere in the world. Both solutions are ideal for commercial vessels and fleets with modest data requirements. In the previous campaign phases, the emphasis was on potential resellers and end users of the Client’s land satellite services. Both the Client and the Callbox team picked up a great deal of insights about the target prospects and the overall market, which proved useful in refining the team’s campaign approach and the Client’s marketing strategy. This time, as the focus shifts to maritime satellite communications, the new campaign’s main objective is to identify and qualify potential subscribers for its bundled Inmarsat services from shipping and maritime companies. The new campaign phase marks the 15th month of the Client’s partnership with Callbox. The Client says Callbox has become a key force multiplier of its marketing initiatives, greatly expanding the company’s reach and scope with multi-channel prospecting and research capabilities. The updated plan consists of database profiling and phone-based conversations with prospects integrated with email touches. 1. The Client provided an in-house list of contacts to be profiled and refined by the Callbox team. 2. The targets include shipping and maritime companies in Asian and EMEA countries not directly covered by Inmarsat and VSAT. 3. The Callbox team used primary and desk research methods to verify and update each record, as well as added new contacts that match the target prospect profile. 1. The Client reviewed and approved all materials used in the campaign, including call scripts, email templates, and the profiled list. 2. Agents engaged prospects through live conversations in order to gauge solution fit (whether they require broadband aboard their ships and how much data they need), as well as to book them for a phone appointment with a rep from the Client. 3. The Callbox team used emails to initiate contact and respond to requests for further information. The campaign has finished one full month (22 days) of appointment setting activities. Since this is only the first month of the new campaign phase, much of the activities focused on priming prospects for live conversations and tweaking the messaging strategy. The Client accepted all 10 booked meetings, citing that each appointment met the company’s sales-qualified lead (SQL) profile. With the campaign generating appointments well ahead of schedule, both the Client and the Callbox team are confident that the number of qualified appointments will increase as the campaign progresses. Throughout the campaign, Callbox made several attempts to reach actual decision makers, which presented some challenge because operators were trained to block repeat calls. In this situation, there is no substitute for experience, and Callbox’s eight-year track record in B2B telemarketing was a key to the ultimate success of the team.